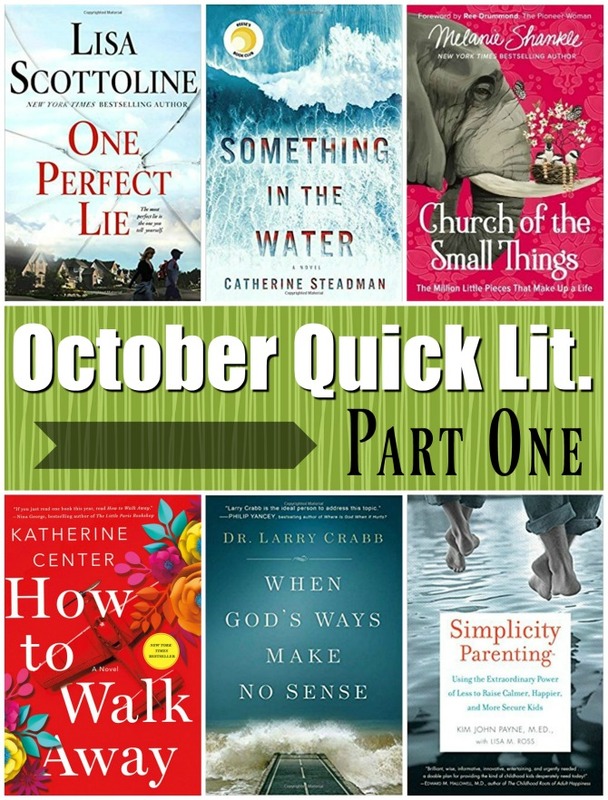 I hope you’re ready for some book reviews, because I’ve got eighteen of them headed your way this week! Today’s batch contains all books that I mostly liked or completely loved. Every one of them is strong enough to recommend. Let’s get right into the reviews! 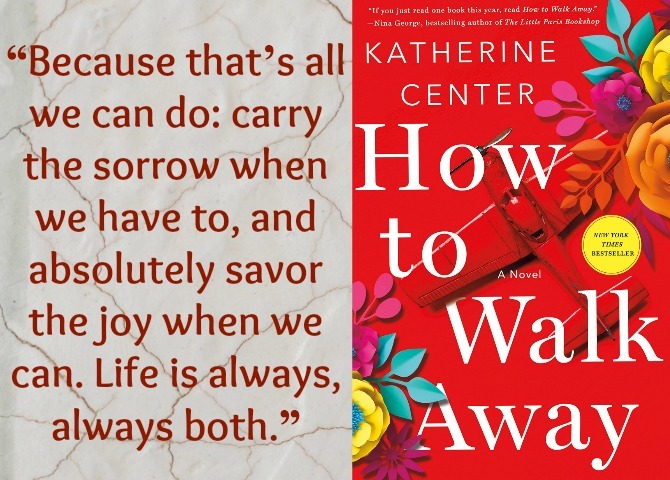 How to Walk Away, by Katherine Center: Margaret Jacobsen has a bright future ahead of her: she recently landed her dream job, her longtime boyfriend has just asked her to marry him, and they are looking forward to a wonderful life together. That all ends the instant her fiancé, Chip (an amateur pilot), crashes the airplane in which he’s just proposed marriage; Chip walks away without a scratch, but Margaret is left paralyzed. Forced to accept that her life is crumbling around her, Margaret throws herself into recovery with the help of her previously-estranged sister, Kit, and Ian, the tough physical therapist with dashing looks and a deep Scottish accent. This book has excellent reviews and I was drawn to the challenging subject matter. I found the descriptions of Margaret’s recovery compelling and surprisingly relatable: though few of us have been paralyzed, we have all faced disappointments in life and been given the choice of how to respond—with courage and fortitude, or with disillusionment and defeat. Margaret experiences depression and pain but proves that she is a survivor. I was inspired by her resilience and her ability to see her accident as a catalyst for empowerment, increased empathy, and renewed perspective on her own values and purpose. I liked the side characters as well: the complicated but ultimately compassionate Ian makes a great leading man, and Margaret’s sister Kit is an enthusiastic cheerleader who adds a touch of silliness to the story. Seeing the restoration that occurs in Kit and Margaret’s broken sisterhood was a true highlight of the book. Though there was clearly much I liked about this book, I did not love it as much as other readers seem to. The lighthearted, falsely optimistic tone doesn’t align with the tragic subject matter. Margaret’s pain and hardship are diminished, which I found neither credible nor helpful for those who have undergone similar tragedies and been unable to regroup quite so quickly. The fluffy romance was too convenient and cheapened what could have been a thoughtful exploration of grief and survival. I also had a hard time getting over the ethical violation at the core of Margaret and Ian’s romance. Ultimately, this is an uplifting and heartwarming story. Those definitely have their place, but given this story’s potential, I wanted more. 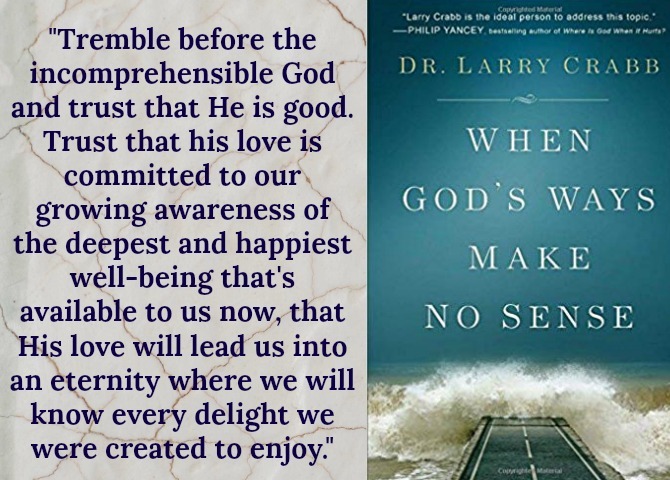 When God’s Ways Make No Sense, by Larry Crabb: It’s the question every person of faith (and those struggling to find faith) has asked: how can a good God allow bad things to happen? In this book, psychologist and theologian Larry Crabb tackles this question. Is God sovereign? If so, how can He allow such suffering? Doesn’t He promise that all things will work for our good? How can this be, when life feels so hard? Dr. Crabb shares from his own experience of questioning God, along with examples of other faithful believers who have entrusted their stories to the Lord, only to be left unsatisfied and unfulfilled and questioning the goodness of God’s intentions. Dr. Crabb also relies heavily on Biblical examples of individuals who trusted God or resisted His will. Crabb’s stories illustrate three possible responses to life’s hardships: we can run away (like Jonah); we can manipulate our theology (like Saul); or we can honor God’s sovereignty, trembling yet choosing trust (like Habakkuk). Though this book doesn’t offer any definitive answers, Dr. Crabb helps his readers understand that God’s ways are not our own, that He sees the big picture in ways that we cannot. In allowing our suffering and letting some prayers go unfulfilled, He is working a good in us that might not be realized this side of Heaven. Crabb reminds us to lean into God and the work that He is doing in our souls—the ultimate good that cannot be thwarted. This is probably not the answer we are looking for today, but we must trust that the Lord has our eternal best interests in mind and that our suffering is not in vain but for the Lord’s glory and our own sanctification. In this, we are able to experience God’s love while also honoring His holiness. I appreciated the message of this book. It’s one that I’ve been wrestling with a lot lately, and I’ve landed upon similar conclusions. I don’t know that this is a book I would hand to a brand new believer still trying to sort through their faith, but it’s a good read for seasoned Christians who have lingering questions and doubts. The writing is dry and pretty tedious, but honest, transparent, and convicting. 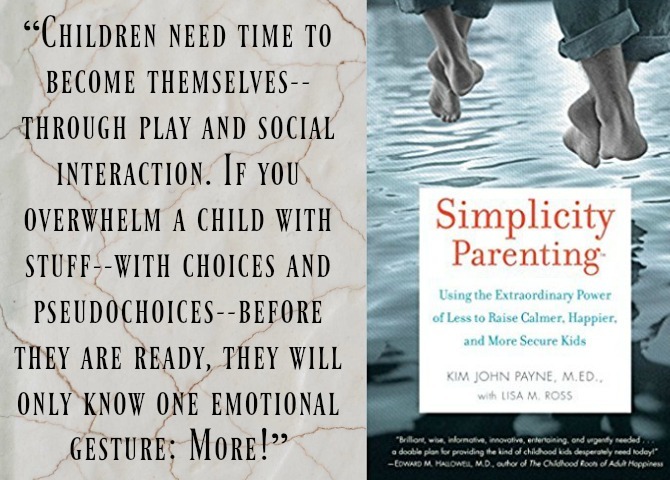 Simplicity Parenting: Using the Extraordinary Power of Less to Raise Calmer, Happier, and More Secure Kids, by Kim John Payne: It’s all gotten to be a bit much, this fast-paced world in which we’ve grown enmeshed. So many activities, so many possessions, so much noise. This age of MORE and EXCESS is taking its toll on all of us, but especially our kids. I feel it, and I’m sure you do, too. In Simplicity Parenting, family counselor and Waldorf expert Kim John Payne illustrates the problem we’re up against—how our fast pace is ultimately “waging an undeclared war on childhood.” He describes the terrifying side effects experienced by overwhelmed and overstimulated kids (which, sadly, is most kids), he points out where we’ve gone wrong, and he outlines a path to freedom. In my favorite section of the book, he describes the causes, symptoms, and prescribed treatment for “soul fever”; I’d not considered how an overwhelmed state could mimic actual illness, but it makes a lot of sense. After making a thorough case for his argument against excess, Payne shows us how to streamline our physical environments by curbing clutter and replacing offensive toys and books with more natural playthings that cultivate creativity and stimulate imagination. (This section contains some fantastic tips.) He goes on to describe the importance of natural rhythms and routines and shows how to implement them into our days while also clearing our schedules of more structured activities. Finally, he addresses the problem of over-involved parents and excessive screen time, and teaches us how (and why) to manage these sources of intrusion and overstimulation. Many of the principles in this book were familiar; in fact, we’ve already been implementing a great number of them in our own home, with positive results. We limit toys and screen time, we strive to create extra space in our schedules, and we generally embrace a “less is more” attitude when it comes to activities and possessions. However, we’re not immune to the siren call of excessive living, and books like this help ground me and remind me of what I know to be right—why this simpler life we’re pursuing is a good one. Though I did like this book, aspects felt a bit preachy and extreme, an attitude present in almost every “simple living” book I’ve read. I would have appreciated a more nuanced approach that acknowledges some of the excess that is inevitable in today’s world. Ultimately, though, this was a inspirational and very practical guide. 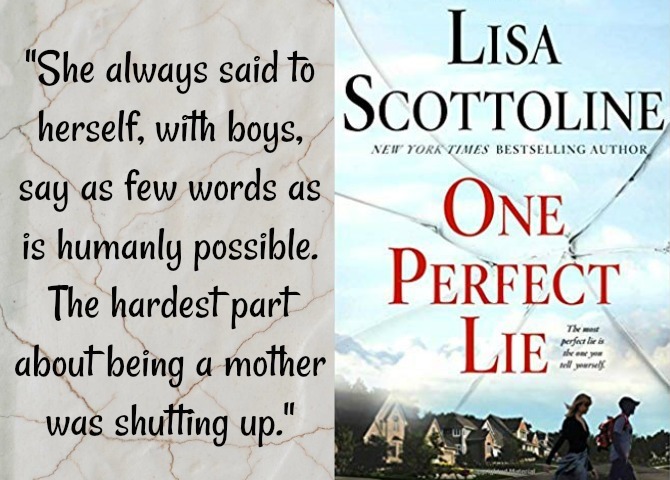 One Perfect Lie, by Lisa Scottoline: Chris Brennan has just been hired as the Government teacher and assistant baseball coach at a small Pennsylvania school. On paper he seems perfect, and the students and teachers eagerly welcome him into their fold. Chris quickly connects with the students, particularly three members of the Varsity baseball team: Evan, the rich and popular kid who suffers from “affluenza”; Raz, who is quirky and a bit of a wild card since the recent death of his father; and shy, eager-to-please Evan, the only son of a single mom who struggles to make ends meet. But Chris’s interest in these three boys isn’t altruistic. He is using them for some unknown purpose. . . because Chris is not at all who he claims to be, and by the time he leaves the school, none of them will ever be the same. This book got its hooks in me from the opening lines. I was invested in finding out who Chris was, and eager to discover his secret. I was also drawn into the stories of the three boys’ mothers, whose experiences are told in alternating chapters alongside the primary plot line of Chris and his mysterious mission. Once Chris’s secret is disclosed (about a third of the way into the book), that particular plot felt too convoluted and unbelievable, and his story (though exciting and action-packed) sort of fizzled for me, but the moms and their boys carried the book. The mothers aren’t particularly well-written, more caricatures undergoing familiar “mom” issues (wayward sons, bills that don’t pay themselves, feelings of inadequacy, philandering husbands), but that didn’t keep me from wanting to know them and empathizing with each of their unfortunate plights. There are some wonderfully tender mother/son moments and some excellent parenting being modeled. Like All We Ever Wanted (reviewed last month) and Us Against You (review coming later this week), this novel left me dreading my future as the mom of a teen boy. Still, this is an engaging read and I’m looking forward to reading more books from this new-to-me author. She earned bonus points from me for the complete absence of crass language in this book, which is nearly unheard of in this genre! 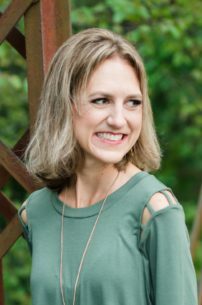 Melanie’s other books have centered on specific roles within relationships (motherhood, marriage, friendship). 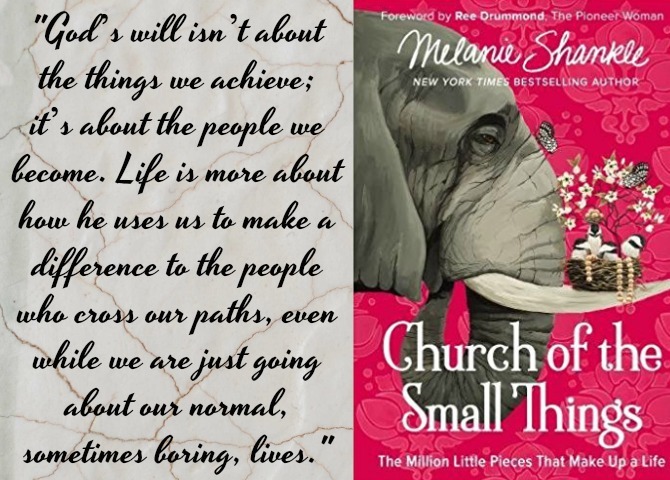 Church of Small Things is a little different in that it focuses on the little, insignificant things that make life worthwhile. I adore this premise—that life is made up of the small things, that they matter and are worthy of attention and celebration. These small things aren’t glamorous or particularly noteworthy, but they can be used by God in remarkable ways. In hilarious essays about everything from her grandparents to her dogs to her distaste for exercise, Melanie shows readers how to intentionally craft a meaningful and purposeful life out of seemingly insignificant moments. No subject is too taboo or precious for Melanie (she covers it all—her parents’ divorce, inappropriate autocorrects, her friend’s cancer, bad haircuts), yet her stories don’t come across as acerbic or harsh, but uplifting and lighthearted. Her writing is wry, relatable, self-deprecating, and surprisingly inspirational. Her tribute to her dad had me in a puddle of tears, while the memories with her grandparents stirred up all sorts of nostalgia, and her path from college party girl to bestselling author provided a much-needed nudge to take myself and my writing more seriously. And Melanie takes us to church with her final chapter; girl can preach! This book was a sweet yet satiating treat. 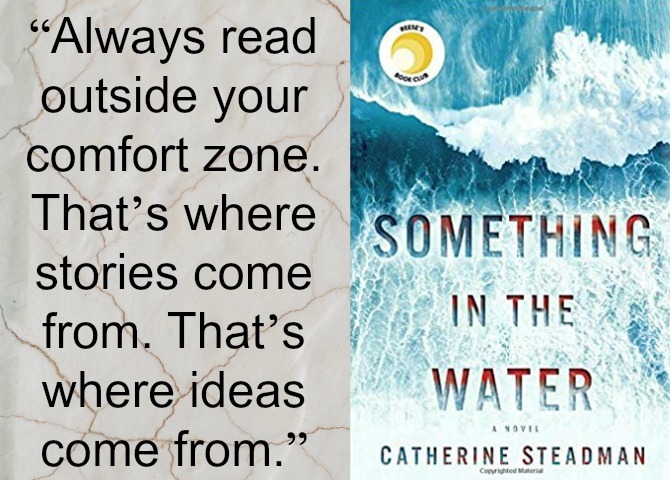 Something in the Water, by Catherine Steadman: When a novel begins with the protagonist digging a hole to bury the body of her husband, you KNOW you’re in for a wild read! After this attention-grabbing intro, we flash back three months. . . . Erin and Mark are newlyweds who are passionately in love. Erin is a documentary filmmaker currently working on a project following three prison inmates. Mark is a financial advisor who has recently lost his job. Despite the financial setback, they embark on a tropical honeymoon where an afternoon scuba diving adventure leads to the discovery of an ominous bag. When they make the decision to uncover the mystery of the bag, they set off a chain of events that cannot be undone. Soon they are deeply immersed in criminal activity, with no idea of the danger lurking around them. The reviews of this book are mixed, so I had low expectations going in, but this debut novel completely blew them out of the water. The story isn’t flawless: the first third moves quite slowly and there are some unfortunate plot holes (not to mention a completely implausible premise), but I was hooked from scene one and was glued to my headphones until the very final chapter. The character of Erin intrigued me. Though she makes numerous bad decisions, I found her innocence endearing and appreciated her documentarian’s manner of recounting her story. I also enjoyed the three prisoners she is interviewing for her documentary; all three have compelling backstories that weave into the primary storyline in some interesting ways. Though the novel is primarily a plot-driven thriller, there are intriguing themes surrounding relationship, trust, ethical choices, and the interplay between our realities and the stories we create around them. The audiobook is superbly narrated by the author (an actress); highly recommend that version! I’ll be back Wednesday with six more reviews!